Jennifer's got an incredible story. She just knew that some people wanted more than a silly blue yoga mat. In 2005, she started a company called Plank, and quickly saw success. Yoga mats that cost $70 to $90 dollars! ...and she's making a killing. When she started in 2007, Jennifer's Charlestown, Massachusetts company brought in an estimated $750,000. Let's face it, unless you are a yoga buff, you had no idea there was a HUGE market for "expensive Yoga mats"! Why Do Some People Work Tirelessly Promoting GOOD Products, And Never Make A Single Penny, While Others Promote Crazy Products...Wild Ideas, And Make Millions??? If you're like me, you've probably asked yourself, "What's the "secret sauce" that these people have, that is holding me back?" What do they know, and do, that I don't? Sure you can make some cash with just those methods...but what about long term success? After all, do you really want to wake up every morning to type out another article, just because the last one has lost its juice already? 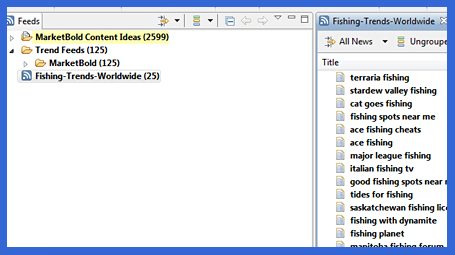 Do you really want to spend your vacation submitting another RSS feed? Now, please don't misunderstand me. There is a lot more to running a business and making a profit than simple market research. In case you haven't figured this out yet, Trend Spotting isn't just for Fortune 500 companies and Stock Brokers. Now, for the first time ever, even the "little guy" can do complex analysis of markets worldwide. Google™ Is Hiding Data From You! There's BIGGER, BADDER trend data than anyone could have imagined. But Google is deliberately hiding it from you. While trend spotting has always been the buzz of the biggest Fortune 500 companies, you can now learn how to TAME THIS TREND BEAST in 2017 & 2018! In this Video, I'll walk you through a quick introduction of the course and show you exactly what you'll learn and how to get started trend spotting fast. 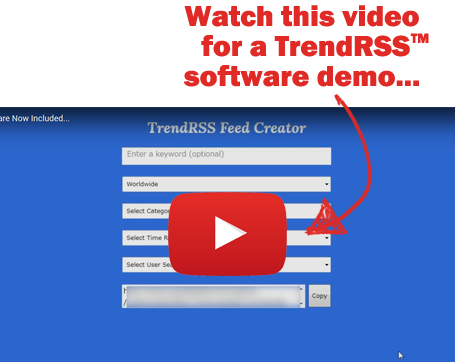 In this Video, you will setup your first TrendRSS™ feed using the software included in the Member's Area. Start seeing top trends in the next 10 minutes! In this Video, you'll see how to fine tune your results to make sure you're seeing the best trends. "By 9am, I'd made $150 profit..."
"Hi Jack, Bought and watched on Wed night. 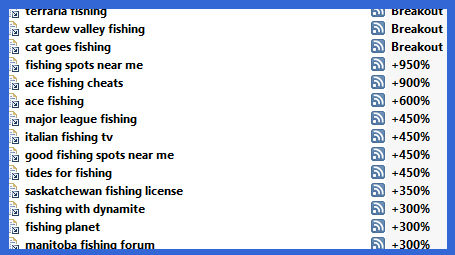 Friday night at 11pm I started playing around with an old niche and saw two keyword trends that I wasn't using. Stayed up to 3am to create landing pages and added the KWs to my PPC campaign. By 9am, I'd made $150 profit on those KWs. Thanks mate! - Frank"
In this Video, you'll see how to get Google's massive server power on your side so you can spot trends, and not just fads! In this Video, you'll see how a grain, the flu, and baby boy showers can teach you how to become a master trend spotter faster. In this Video, you'll explore the power of data ranges so you can see how the buyers are searching for the things they want to buy. "Got more traffic in 10 hours..."
"Jack, I've used the tool as you suggested for article marketing. I found a term and wrote an article around it. Within 10 hours of posting my article on my blog, I started getting traffic. I dug and propellered my article and now it's #2 out of 709,000 on a broad search on Google. People are searching for that term, yet no one else has written an article with the exact phrase that was found with the tool. - Akogo"
In this Video, you'll see exactly what time you should present your offer to your market so you can get them at their peak interest time when they're most likely to buy your product. In this Video, you'll see how to fine tune your searches to make sure you're seeing where the profits are in the market and not being fooled by incorrect or missing data. In this Video, you'll see how to get Google to return the hottest keywords in any market, even if you don't know any keywords for the market in the first place! "One of the best I've seen..."
"Hi Jack, Just wanted to say that the resource is one of the best I've seen. I'm going to blame you for some sleepless nights to come! Kind regards, Brian"
In this Video, you'll discover how your buyers type in their searches, so you can make sure you present your product or service along the entire buying path. In this Video, you'll see how easy it is to find hot trends at the #1 Video streaming site in the world, YouTube. In this Video, you'll learn how to find out when your market is most interested in your products or services, even if you've never been in the market in the past. "OWN the market...pure and simple"
"OK Jack...here's the deal. You send me your Social Security # and I'll send you my Credit Card #. That way you can send me all your reports automatically and I can claim you on my income tax returns. Deal? What a series of videos. Wow! The real beauty of all of this is that anyone wanting to take this offline to local advertising would OWN the market, whatever it was, pure and simple. Not only that, but you could FIND a local market! Brilliant! Naturally, this is aimed at the web, but the possibilities are only confined by imagination. This is true "Laser Marketing" I am reduced to one word: Thanks!! Jack"
In this Video, learn your buyers purchase path and what they do just before they buy. Spy directly on your competitors Google Analytics Ecommerce stats! In this Video, you'll learn how to position your message to the exact place where there is the most interest for buyers to purchase your product. In this Video, you'll learn how to get in front of the buyer with the right message at the right time. "Thanks for this great offer, Jack. The videos are high quality and packed with real value for all IMers. -Dave"
In this Video, learn how to use 150,000 trend hunters on the web, find keywords and companies driving the biggest trends, and locate the keywords and domains to get started profiting from those trends today! I'll show you how easy it is to make sure you're getting the correct trend data, everytime, so you can spot the trends that will bring you the most traffic. If you're product or service is sold overseas, you've got to take a look at the powerful trend data available for other countries. "The Videos are PURE GOLD..."
"Jack - had to take a 'break' from my vacation to buy and view your offer! The Videos are PURE GOLD! And well worth it - market research is the golden key to wealth and your product not only shows how to do it (using bleeding edge tactics), but how to apply that research into money making ideas. 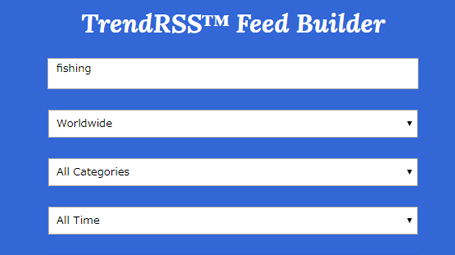 Cheers, Mia"
TrendRSS™ will send you the hottest keyword trends in your market automatically. It's extremely easy to use and takes just a few minutes to setup. "One of the best I've seen in 9 years..."
"I have been doing this for 9 years and this is one of the best things I have seen come along in quite while. Beautifully done Jack...Easily worth 10x's the price for this information. Everything is explained in perfect detail and I can see a lot of use for this information. Especially that new video you just added.... KILLER! - Mike Hill"
"I don't think I will sleep at all..."
"My normal schedule is to go to bed at 3:00 am, but after I saw your videos I don't think I will sleep at all.So many ideas, so little time... You opened my eyes, man!!! :) Thank you for a wonderful offer! To your online success, Tayweb"
"Grinning and shaking my head..."
"Thanks Jack, Excellent resource. I just kept grinning and shaking my head. Smart man you are. I'm off to make some money now, which just got a whole lot easier. - Tate"
"I'm only on video 3, but..."
"I've watched these videos twice and been using the information since I got them. Jack explains everything in a lot of detail. You can benefit from going through the videos again and again because there is always something new to be found. If you are looking for some ideas for promotions or products you can't beat this tool and you certainly can't do better than to get Jack's videos. Fantastic offer. - A." "WOW! Great info! Been watching these vids now for the last 45 minutes or so... This is the 21st century of the 1800's 'Gold Rush'... Definitely money well spent!"